A classic anthology for GCSE. 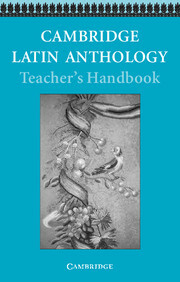 This Teacher’s Handbook accompanies the Cambridge Latin Anthology, which has been designed as a prescribed text for GCSE Examinations and for general reading in the first year of an advanced level course. The Teacher's Handbook gives a brief introduction to each passage, followed by notes on points of language, stylistic features and references in the text. A Discussion section includes ideas and questions that can be raised with the class. Notes on the illustrations are provided, along with suggestions for further reading. Covers a wide range of prose and poetry. Prepares students for reading a range of Roman authors in the original. Glosses, explanations and a complete vocabulary are included.